What Would You Choose to Read in School? In our most recent Turn the Page article, Kelly Gallagher shared that kids in high school today may be fake-reading their way through their studies. As a result, students are losing their ability to think critically and analyze complex materials because they choose not to read, in or out of school. With almost instantaneous access to resources such as SparkNotes and other tools to get out of assigned reading, young adults often choose other activities in lieu of reading “boring” books for English class. This was the case for Adison, now a Minnesota high schooler. In her elementary and junior high years, Adison hated reading and hardly ever read anything in school, even if it was required. Adison said her prior teachers had “ruined reading for her,” and she didn’t think there were any books worth her time. Everything changed, however, when she heard from a friend about a book called The Fault in Our Stars by John Green. Adison was soon caught up in the same craze as her friends and began to read other John Green books out of curiosity. Adison was transformed as she began to see that reading can be fun with the right book, branching out and reading other novels, such as the Divergent series. The word of mouth that ignited Adison’s love for reading is tremendously powerful. Teens hear every day about what things are “cool” and books are no exception. Just as Adison heard from a friend that John Green was a good author, many teens are influenced heavily by their peers in deciding what books to read or not read, especially with required or independent reading assignments in English class. In this Readers Write, we asked teens what book they would like to read and study in English class, and we asked adults what books they wish they had studied when they were in school. Mystery, fantasy, and horror topped the list. Several students said reading from scripture and learning world religions and traditions would be interesting, regardless of personal beliefs. Harry Potter, Lord of the Rings, Percy Jackson, and Star Wars were noted the most. Teens said books in “modern English” are more attractive than “older English” that requires deciphering the language as well as plot. They would like to read more adventure, with more excitement and interest and a compelling storyline—they want an assigned book to be a book they would want to read even if it weren’t required in class. Once they get into those kinds of stories, they want to keep reading. 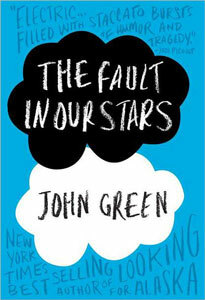 Like most teens, Adison’s reading of John Green offered an opportunity to “connect and relate with the story as a teen, as well as delve into the feelings you have for the characters,” she said. Books are much more appealing to young adults if the subject matter can be related to their own life and if they can feel the emotions of the story blend with their own. An AP English teacher at one high school noted that at her school, they emphasize independent reading because each student has different interests. Half the challenge for her is helping students find books they want to read. Students have the ability through independent reading to apply the same lessons about plot, literary devices, syntax, structure, and rhetorical analysis from regular English books to independent reading novels or plays. Teens also said that acting out a scene of a play, discussing deeper questions, or other forms of interactive learning make the reading more fun and add to the experience of reading the book. Teens found that the stories they were most engaged with usually correlated to the books they found the most fun to study. Books are more popular with young adults if they relate a common sentiment the reader shares. Teens have enough diverse experiences that they can pull out what’s relevant to their life. Teens today are inundated with content entertainment—their smart phones display Twitter feeds, Snapchats, Instagram posts—live, interactive words and images to capture their attention and imaginations. But they also enjoy reading books, if the book is interesting to them. 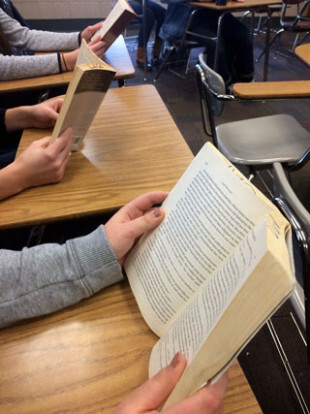 In today’s always-on world, one key to keeping students engaged is variety—finding different ways to bring books alive through more than just the words on the page. As Adison’s story shows, word of mouth is a powerful influence among teens. Once you get one teen interested in a book, that student will tell others. Giving teens a choice about what they read and facilitating meaningful, fun discussions about those books in class, allows teens to spread a love of reading to their peers. If given a choice, #WhatWouldYouRead in school? Feature photo by Alexander Pavlicin. Alexander Pavlicin is a high school student who has written feature articles and columns for school and community newspapers. His favorite books to read are YA fantasy and nonfiction. 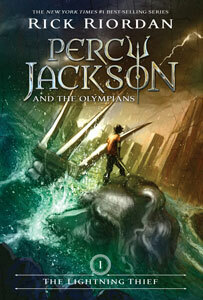 Percy Jackson forever. I am a huge fan of the series, and I think that the characters are people children can really relate to and understand.